We have such a gorgeous podcast for you today as we got to interview the wonderful Sarah Tomczak, who is the editor over at Red magazine and a woman who we so admire. We came away from this interview feeling so inspired by Sarah’s overall approach to life, work and relationships. She’s an incredible example of a woman who is juggling a successful career and family, so is spinning a lot of big plates, but seems to do it with a lot of ease, joy and love. And her joyfulness is SO infectious (check out her Instagram to see what we mean!). Listen in as we talk about definitions of success (and how they can change over time), what it’s like to be editor of a top magazine (and how she got there) and living a perfectly imperfect life that is unapologetically joyful. And so much more! Can’t wait for you to listen to this one - and when you do, let us know what you think and what resonated with you. We always love to hear from you! Well we were there to help host a couple’s rewilding retreat put on by the amazing Canopy and Stars and owners of the magical Brook House Woods, Penny and Will, who had run a competition for four lucky couples to win a place on the retreat, staying for two nights in one of the luxury treehouses. They shared with us what it was like to come up with such an incredible dream together and actually make it happen, how living their dream life amongst the woods has changed them and positively impacted their relationship and the advice they would give to someone who also has a big dream that they’d love to make real. 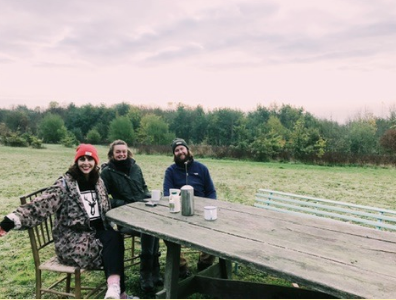 Oh and we recorded the podcast in a meadow overlooking the beautiful hills of Herefordshire. Doesn’t get much better than that!